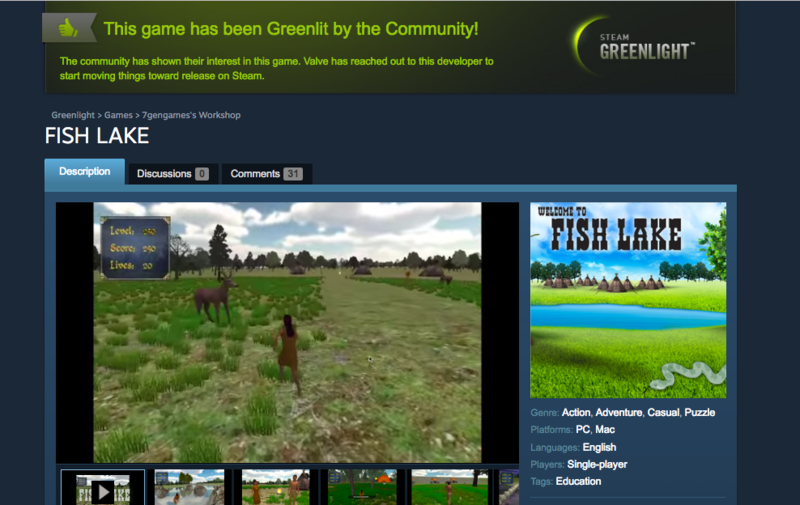 Home » Blogs » 7GenGames » Fish Lake Gets Greenlit on Steam! My mom* isn’t the only one who thinks we’re cool! Yesterday, we learned Fish Lake got Greenlit on the game-distribution platform Steam. What does that mean? Well, some really cool things. First off, if you’re not familiar with Steam and its Greenlight process, Steam is a huge global game distribution platform. Obviously if you’re making games, it’s the kind of thing you want to be on. But part of what makes Steam attractive – both to players and developers – is that it values quality over quantity. It’s not just a platform with games, but a platform with good games. In order to maintain vet games that go up, Steam turned its approval process over to its users. In order to get your game on Steam, you have to go through Greenlight. On Greenlight, you put up images/videos of your game and description, and then the Steam community votes “Yes please” or “No thanks.” People also can comment on your project. Point being, that getting a game Greenlit provides some market validation. It means that people beyond ourselves think that our games is one people would be interested in. Getting on Steam now means that we get to sell our games via a platform that can have almost 11 million users concurrently online on a given day and that has over 125 million active users. And it’s an audience that’s already playing – and paying for – games. We long ago recognized that there’s not any one thing that’s going to make your startup a success, but there certainly are things that have the potential to make a positive impact in toward your achieving success. We think getting our game on Steam is one of them. Since Fish Lake is actually done (a lot of Greenlight projects are posted when they’re still in the development phase), we’re working to do what we need to in order to get it up and available on Steam as soon as possible. We’ll let you know as soon as it’s live. So to everyone who supported us on Steam Greenlight, thank you! You are awesome, and we love you! And to all the haters/armchair game developers, ha ha, we got Greenlit! *And I mean, obviously, my mom thinks we’re cool too since she’s one of the founders. Congratulations! Your hard work is paying off. It helps that you guys do your homework and know what is important to be successful!